President Donald Trump said on Thursday that he's "not thrilled" with the Federal Reserve for raising interest rates. 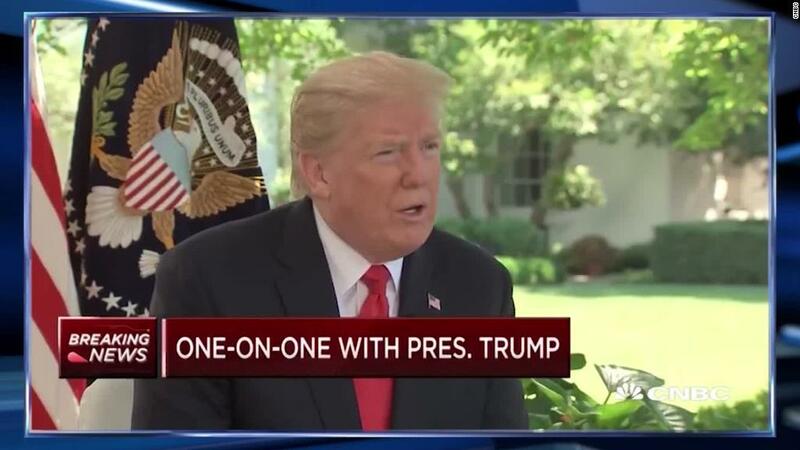 Breaking with tradition to avoid criticizing the Fed, Trump told CNBC he's worried that the central bank's policies will cancel out his efforts to speed up the economy. "I don't really — I am not happy about it," Trump said in excerpts released by the network. He also said that higher interest rates will strengthen the US dollar too much, putting the United States at a "disadvantage" while central banks in Europe and Japan keep rates low. Trump complained that China's currency is "dropping like a rock." Even though he's frustrated, Trump said he's "letting them do what they feel is best." He also called Jerome Powell, whom Trump nominated to lead the Fed, a "very good man." A spokesperson for the Fed declined to comment. The Fed began raising interest rates from emergency levels in 2015, under Powell's predecessor Janet Yellen. Powell has said the economy is strong enough for the Fed to keep raising rates gradually. Testifying before Congress on Tuesday, Powell cited "robust job gains" and an overall "solid pace of growth" as reasons for recent and future rate hikes. Presidents have historically avoided criticizing the Fed, which is designed to be independent from political interference. The Fed is charged with keeping prices stable, often by raising interest rates to prevent the economy from overheating. A loss of confidence from investors could lead to concerns of runaway inflation. "This is extraordinary to see Trump go after the Fed like this," said Greg Valliere, chief global strategist at Horizon Investments. Former President Richard Nixon was criticized for bullying the Fed into keeping interest rates low, pressure that led to debilitating inflation. Since then, the Fed has sought to reassure investors that it is independent. "If the market starts to feel the Fed is being manipulated politically, that's a really bad story. It would lead to fears that the Fed won't be as vigilant against inflation," Valliere said. Related: China's yuan plunges again. Is a currency war coming? Trump's criticism of the Fed could backfire if Powell and the Fed feel the need to prove their independence. "This puts Powell in the very awkward position," Valliere said, "of having to show the market that he's tough on inflation." Trump defended his comments to CNBC by saying he is "just saying the same thing that I would have said as a private citizen." "So somebody would say, 'Oh, maybe you shouldn't say that as president.' I couldn't care less what they say, because my views haven't changed," Trump said. Still, Wall Street took notice of the president's apparent desire for a weaker dollar. The greenback quickly lost ground and Treasury yields retreated. "Uncertainty over the White House's dollar policy will certainly sow renewed seeds of doubt into global investors," Viraj Patel, foreign exchange strategist at ING, wrote in a report. Trump had a love-hate relationship with former Fed chief Janet Yellen. During the 2016 campaign, Trump said she should be "ashamed of herself" for creating a "false stock market" with low rates. As president, Trump last year said Yellen had "done a good job" and said he liked that she's "historically been a low-interest-rate person." He still declined to nominate her for a second term as Fed chair, choosing Powell instead. Powell has downplayed concerns about Trump's politicizing the Fed. "We have a long tradition here of conducting policy in a particular way, and that way is independent of all political concerns," Powell said in a radio interview last week with "Marketplace." Powell added that "no one in the administration has said anything to me that really gives me concern on this front."